"Troll's blood, what happened to you Pavo?" 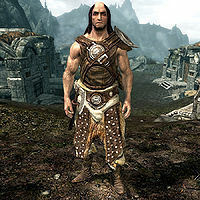 Skaggi Scar-Face is a Nord miner who is in charge of Left Hand Mine, the small mining settlement near Markarth. He is the husband of Sosia Tremellia. He recently received an unexpected visit from colleagues Pavo Attius and Gat gro-Shargakh, both of them victims of a recent Forsworn attack. During the related quest, Skaggi will ask you to clear Kolskeggr Mine of Forsworn, so Pavo and Gat can return safely to their mine. Skaggi owns a house near the mine entrance and sleeps there every night between midnight and 6am. After a one-hour breakfast he heads up to the smelter for eleven hours of work, followed by a one-hour dinner at 6pm. He spends his evenings wandering around the settlement before he finally finds his house and his bed at midnight. He wears a set of studded armor with a pair of hide boots. He carries an iron war axe, his house key, a spare belted tunic, and a selection of middle-class items and gold. Skaggi: "Troll's blood, what happened to you Pavo?" 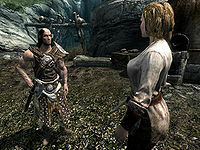 Pavo: "The Forsworn have taken Kolskeggr Mine. We're the only ones left." Skaggi: "Gods.... You two head inside and get some rest. I'll send word to the Jarl." 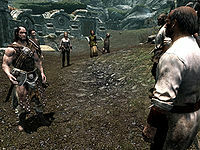 Everybody will then go their separate ways and if you approach Skaggi, he will be quite worried about the increasing amount of Forsworn attacks: "Damn Forsworn. Only a matter of time before they hit here, too." and "Guess we'll have two more mouths to feed for a while." He cares little beyond the money he can make from mining and he will often tell you: "Don't have much to say unless you're here to mine metal." It also becomes clear that he doesn't allow any trouble in his mines after he warns you: "I'm in charge of Left Hand Mine. You cause trouble, you answer to me." He seems to be making a good deal of money from the mines due to the war and he will be quick to tell you: "Left Hand Mine deals with iron, the perfect metal to dig with a war going on." When asked if he owns the mine, he will respond: "That I do. If you want to grab a pickaxe and dig up some iron, feel free. I'll pay for anything you bring me." When asked about the Forsworn, he will explain the situation for miners and farmers all over the Reach: "Seems Kolskeggr Mine got hit by Forsworn. Those madmen get more bold every season. Pavo and Gat are the only survivors. I'll be sending word to the Jarl about this, but I don't know when help will come." If you choose not to offer your help, he will just respond with: "Aye." If you offer to help Pavo and Gat, he will be happy, but will also provide a bit of fair warning: "I'm sure Pavo would be grateful, and we'd all rest a little easier. But that's nonsense. You can't handle a group of Forsworn by yourself. If their axes don't get you, their magic will." "I'm sorry my daughter gives you so much trouble." Daighre: "Do you think the Forsworn will come here? I mean, if they attacked Kolskeggr...."
Skaggi: "Let's just hope that doesn't happen." Daighre: "Skaggi tells me that you were bothering him today. Can't you and Torom just play by yourselves?" Erith: "But mom, it's so boring with just me and Torom. I was just asking Skaggi some questions." Daighre: "You leave him alone. I don't want to hear Skaggi telling me you've been bothering him again!" Skaggi: "You work hard, Daighre. Glad you have stayed with us." Daighre: "I'm grateful, Skaggi. I'm sorry my daughter gives you so much trouble." This page was last modified on 18 October 2013, at 16:36.